Rapid Spa can custom order Lloyd Flanders patio furniture! Stop in to browse through the catalog and choose your styl & fabric. Marshall B. Lloyd was world famous for his fine hand woven wicker furniture and baby buggies made in Menominee, Michigan since 1906. 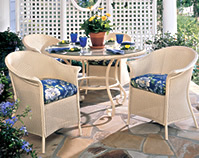 In 1917 he patented a revolutionary new process for the manufacture of wicker. Wicker fabric was woven from a twisted fiber made of kraft paper. This woven wicker was the simple beginning of a brand new category of exceptional quality, innovative furniture that could be mass-produced. He called it Lloyd® Loom. Between 1920 and 1940, Mr. Lloyd produced many new, unique furniture designs — from large settees to small wastepaper baskets — that furnished residential homes as well as commercial properties. Lloyd®/Flanders has since adapted many of the early designs for presentations in current wicker collections. Original designs using the Lloyd® Loom wicker fabric range from traditional to contemporary ... for use indoors or outdoors in casual settings. Lloyd® Loom products have been enjoyed at Buckingham Palace, the U.S. Open, Wimbledon, on the London Northeast Railway and other notable places around the world.